The Spider-Man: Into the Spider-Verse character posters have arrived and they're all pretty cool. 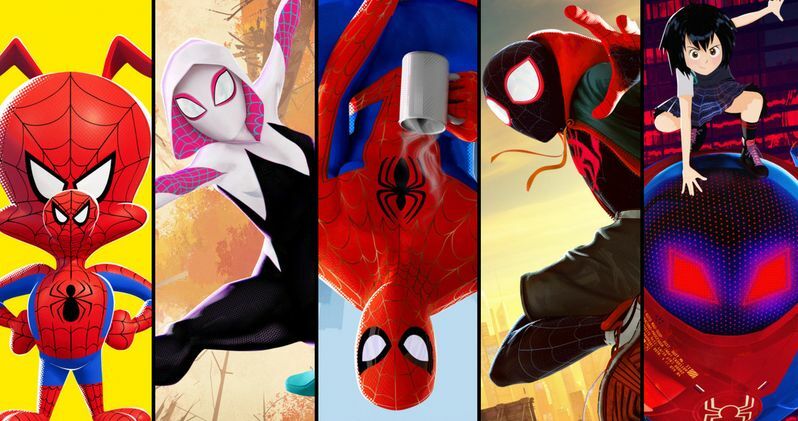 The posters feature Miles Morales (voiced by Shameik Moore), Peter Parker (voiced by Jake Johnson), Gwen Stacy (voiced by Hailee Steinfeld), Spider-Man Noir (voiced by Nicolas Cage), Peni Parker (voiced by Kimiko Glenn), and Spider-Ham (voiced by John Mulaney). Each poster has its own unique style, based on the character. Now that the movie is just about a month away, it's time for the promotional campaign to kick into overdrive. The Peter Parker poster is a lot more adult than the others. He's in full costume drinking coffee while hanging upside down, which shows that there's some other elements of his personality that will more than likely be explored in the movie. Miles Morales' poster is more adventurous, and no, it does not feature the cape that he wants so badly. The Spider-Gwen poster is probably the most flashy as far as coloring goes, while the Spider-Man Noir poster is the complete opposite, with all black, white, and gray coloring. Peni Parker is on a giant robot in her poster and Spider-Ham's poster is simply him with a yellow back drop. All of the posters mention that the movie hits theaters on December 14th, which is the most important aspect. In the latest promo for Spider-Man: Into the Spider-Verse, Miles Morales learned that he had the power of invisibility. However, it seemed like an accident, and the character could not figure out how he was able to trigger the power. It took the older, more experienced Peter Parker to explain that it was because of fight or flight, but Morales still didn't grasp the concept. With that being said, it's going to be cool to see Miles Morales learn to harness his new-found abilities. Additionally, it's going to be interesting to see how Morales and the other Spider-Men and Women interact with each other. Like the previous bits of promotional material, the new Spider-Man: Into the Spider-Verse character posters all have that unique style that has been showcased in the trailers. Phil Lord and Chris Miller indicated early on that they wanted the animated movie to look like an animated version of a comic book, and it looks as if they succeeded with their mission. Everything looks bold and three dimensional. It truly looks unlike anything comic book fans have ever seen on the big screen. Phil Lord and Christopher Miller, the creative minds behind The Lego Movie and 21 Jump Street, have brought their unique talents to a fresh vision of a different Spider-Man Universe, with a groundbreaking visual style that's the first of its kind. Spider-Man: Into the Spider-Verse introduces Brooklyn teen Miles Morales, and the limitless possibilities of the Spider-Verse, where more than one person (or animal) can wear the mask. You can check out all of the Spider-Man: Into the Spider-Verse character posters below, thanks to Sony Pictures.